Worldwide, tuberculosis (TB) is still a serious and significant health concern, more so with the emergence of multidrug-resistant-TB. The inability of mankind to control this infection stems from the fact that the vaccines and drugs that were once effective against TB are no longer efficacious. This has led to a search for new antituberculous agents and adjuvant therapy. Vitamins are being revisited for their role in pathogenicity as well as for their antimycobacterial properties. Vitamins such as biotin and thiamin are essential for Mycobacterium tuberculosis and are required for establishment of infection. On the other hand, vitamins such as Vitamin C and Vitamin D have been shown to possess antimycobacterial properties. To combat M. tuberculosis, innovative strategies need to be devised, keeping in mind the efficacy of the agent to be used. Vitamins can prove to be useful agents capable of modifying the life cycle and biology of M. tuberculosis. We present here a brief overview of the available knowledge on thiamin, biotin, Vitamin C, and Vitamin D, keeping TB treatment and control in perspective. Mycobacterium tuberculosis, the etiological agent of tuberculosis (TB), is a scourge for mankind and still continues to be the major cause of morbidity and mortality among humans. In 2015 alone, there were 1.8 million deaths and 10.4 million new cases of TB. First-line antituberculous therapy for drug susceptible TB effectively cures almost all patients within 6–9 months. However, the first-line drugs may become ineffective due to the development of resistance or intolerance which necessitates lengthy treatment courses, frequently 12–18 months or longer. The long duration of treatment increases the risk of noncompliance and drug toxicity. Therefore, there is an urgent need to revisit the drug therapy currently in use for the treatment of TB. People suffering from TB are often malnourished, and they are at higher risk of getting the infection because of their weakened immune response. Nutritional supplements with macronutrients as well as micronutrients such as essential vitamins or minerals could help patients fight the disease by strengthening their immune response., Vitamins have always been considered important supplements that boost immunity. Recent studies have explored the antimycobacterial nature of vitamins. In one of the studies, it was found that Vitamin D possesses antimycobacterial properties and acts directly when added into the growth medium  [Figure 1]a. The same was true for Vitamin A. Recently, a study by Vilchèze et al. showed that Vitamin C can kill M. tuberculosis through hydroxyl radicals generated through Fenton's reaction [Figure 1]b. In a cross-sectional study performed in Ethiopia, concentration of Vitamin C, Vitamin E, and Vitamin A was found to be lower in TB patients as compared to healthy controls. Reports state that maintenance of an adequate level of Vitamin D may be effective as a prophylactic method against some respiratory tract infections. In addition, the close association has been found between Vitamin D levels and TB. In fact, during the preantibiotic era, cod liver oil and exposure to sunlight were in practice for TB treatment. Vitamins form an important part of the dietary supplements of the human diet. They have to be taken exogenously either because humans cannot synthesize vitamins or because, if produced, the concentration is not sufficient. Humans can synthesize Niacin (Vitamin B3) and Vitamin D but lack the ability to synthesize Thiamine (Vitamin B1), Riboflavin (Vitamin B2), Pantothenic Acid (Vitamin B5), Pyridoxine (Vitamin B6), Biotin (Vitamin B7), Folate (Vitamin B9), Cobalamin (Vitamin B12), Vitamin E, Vitamin C, and Vitamin K. Not only antimycobacterial properties of vitamins but also essential biosynthetic pathways operational in M. tuberculosis and involving vitamins are being studied from drug target perspective. Absence of analogous pathways in humans makes biotin and thiamin biosynthesis pathways fascinating drug targets., Vitamins play a diverse role in the infection and pathogenicity of TB. Studies involving biotin, thiamin, Vitamin C, and Vitamin D have gained significance primarily due to their efficacy as drug targets or because of their antimycobacterial properties. In the present review, we have elaborated the role of vitamins and their involvement in the fight against TB. Thiamin is an essential micronutrient required by amino acid and carbohydrate metabolic enzymes in its active form, i.e., thiamin diphosphate., It is required for the biological activity of pyruvate dehydrogenase, transketolase, acetohydroxyacid synthase, and 2-oxoglutarate dehydrogenase. Most of the prokaryotes as well as fungi and plants can synthesize thiamin but mammals lack the pathway and are dependent on dietary uptake. Thiamin biosynthesis is well studied and requires an array of enzymes which involves coupling of 4-methyl-5-β-hydroxyethyl thiazole phosphate (thiazole moiety) and 4-amino-5-hydroxymethyl-2-methylpyrimidine pyrophosphate (pyrimidine moiety). Thiazole and pyrimidine moiety are synthesized by different mechanisms. Thiazole moiety, in Escherichia More Details coli, is synthesized by oxidative condensation of cysteine, tyrosine, and 1-deoxy-D-xylulose 5-phosphate, whereas in Bacillus subtilis, tyrosine is replaced by glycine. For the synthesis of pyrimidine moiety, aminoimidazole ribotide is catalyzed by ThiC to generate hydroxymethylpyrimidine phosphate which is further phosphorylated to form pyrimidine moiety. Enzymes involved in thiamin biosynthesis in M. tuberculosis, i.e., thiC, thiD, thiG, thiS, thiF, thiO, iscS, and thiL are found to be essential as identified by transposon site hybridization technique. Although trace thiamin requirement of several microorganisms can be compensated by an exogenous source or by as yet unknown enzymes, M. tuberculosis does not have thiamin salvage mechanisms, making thiamin biosynthetic mechanisms attractive drug targets. M. tuberculosis thiamin phosphate synthase, the gene involved in the synthesis of thiamin phosphate which is further phosphorylated to the final product, i.e., thiamin pyrophosphate in mycobacteria, was screened bioinformatically for drug targets by investigators. Results obtained after virtual screening were tested in vitro and one of the tested compounds showed potent antimycobacterial activity with a minimum inhibitory concentration (MIC) of 6 μg/ml. Further studies are required to validate these findings and possibly reveal more potential drug targets. Vitamin B7 or biotin is essential for growth and pathogenicity of M. tuberculosis. It works as a cofactor in two of the key enzymes required for fatty acid synthesis and anaplerosis namely acyl CoA carboxylase and pyruvate carboxylase. These enzymes are responsible for metabolic fixation of carbon dioxide. Biotin is indispensable for all living organisms. However, its synthesis is limited to microbes, plants, and some fungi. As for thiamin, humans are dependent on a dietary supplement or gut microflora for their daily uptake of biotin. It has been suggested that de novo biotin biosynthesis is necessary for M. tuberculosis since it lacks any biotin transporters as suggested by genetic studies. Moreover, serum concentration of biotin is too little in the human host, to fulfill the requirement of the microorganism. Biotin is synthesized with the help of enzymes BioF, BioA, BioD, and BioB using pimeloyl-CoA as a precursor.,, Synthesis of biotin from pimeloyl-CoA is well conserved in all the biotin-synthesizing organisms. However, variation has been observed in the pimeloyl biosynthetic pathway, wherein two organisms, namely, E. coli and B. subtilis have been well studied. The former utilizes a modified fatty acid pathway for biotin biosynthesis while the latter utilizes cytochrome P450 enzyme for the generation of pimeloyl-CoA. In one of the studies carried out by Keer et al., disruption of BioA rendered the M. smegmatis with stationary phase growth defect on carbon-depleted medium. Genome wide genetic screens carried out by Sassetti et al. have also identified bioF, bioA, bioB to be essential for virulence and pathogenicity of M. tuberculosis. Rengarajan et al. showed similar results where disruption of bioF and bioA hampered bacterial growth in murine macrophages. Studies are being carried out to identify novel drugs that can target these genes. BioA has been shown to be a target for aryl hydrazines and hydrazides. It was shown by Kitahara et al. and Sandmark et al. that amiclenomycin (a naturally occurring compound) has the ability to hamper mycobacterial growth by targeting bioA enzyme of M. tuberculosis and thereby inhibiting biotin biosynthesis pathway., However, due to amiclenomycin's highly polar nature and chemical instability, much work is needed to develop this as a potent drug. Screening of about 350,000 chemical compounds from Molecular Libraries Small Molecules Repository against BioA enzyme and cocrystallization of the selected compounds with bioA has further opened new vistas in selecting bioA as a drug target as well as establishes the efficacy of biotin biosynthesis for further drug development. Actithiazic acid, a naturally occurring compound obtained from Streptomyces species, has also shown inhibitory effects and blocks biotin biosynthesis. Further research is required to establish biotin biosynthetic genes as prime targets for antituberculous activity. Vitamin C is an essential micronutrient for human beings and has to be taken as a dietary supplement since humans cannot synthesize Vitamin C because of the mutation in the gene encoding the enzyme gulonolactone oxidase. Vitamin C protects the host from reactive oxygen and reactive nitrogen intermediates generated during mycobacterial infection. It is involved in the synthesis of collagen, iron transport and acts as a physiological antioxidant. It also enhances the T-cell response and directs the increased migration of leukocytes at the infection site. For prevention of common cold and influenza, Linus Pauling in 1976 recommended 1–3 g/day Vitamin C. Several studies have suggested the role of Vitamin C in prevention and treatment of TB by orally administering the vitamin. Vitamin C deficiency has also been linked to TB infection. A study conducted on a sample size of 1100 individuals diagnosed as nontuberculous initially, correlated nutrition status with predisposition of TB development. Of all individuals, 28 developed TB during the course of the study and it was observed that they had suboptimal Vitamin C concentration. It has also been shown that Vitamin C acts as a trigger for the induction of dormancy in M. tuberculosis. Vitamin C induces DevR (DosR) regulon which is responsible for the development of dormancy in bacteria. A study identifying synergistic effects of Vitamin C when used with rifampicin and isoniazid found some interesting results. It was observed that there was reduction in the colony forming units of wild type H37Rv strain as well as drug-resistant strains, when grown in the presence of Vitamin C and rifampicin at suboptimal MIC. Reduction in CFU in wild type and drug-resistant strains was also observed when Vitamin C was tested synergistically with isoniazid. However, isoniazid-Vitamin C synergy showed a weaker effect against resistant strains as compared to wild type H37Rv. Narwadiya et al. have shown an association between Vitamin C concentration and anti-TB properties of medicinal plants. Vitamin C reduces ferric to ferrous ion which generates superoxide, hydrogen peroxide, and hydroxyl radicals in the presence of oxygen through Fenton and Haber–Weiss reaction., These radical moieties then damage DNA and lipids of M. tuberculosis leading to growth impediment [Figure 1]b. Vitamin C is also believed to reduce the level of guanosine 5'-diphosphate 3'-diphosphate (ppGpp), a molecule thought to be involved in growth regulation and stress response in M. tuberculosis. Trials carried out by Volchegorskii et al. using Vitamin C supplementation, have observed some positive results that merit further investigation. The role of Vitamin D in maintaining calcium homeostasis and bone mineral density in humans is well known. It has two major forms ergocalciferol (Vitamin D2) and cholecalciferol (Vitamin D3). Vitamin is obtained either through diet or exposure of epidermis to sunlight (ultraviolet B [UVB] radiation). However, its role as a protective agent against various diseases is being revisited. Studies have correlated Vitamin D deficiency and susceptibility to TB since 1651, when vitamin deficiency was found to be associated with signs and symptoms of TB for the first time. Later, heliotherapy became common practice for patients with TB and formed the basis of treatment in sanatoria. Moreover, Stead et al have shown racial differences in the incidence of TB which was associated with the levels of 25 hydroxy Vitamin D. Although conflicting results have emerged from clinical trials, in one of the studies carried out by Salahuddin et al., they observed that high doses of Vitamin D supplementation enhanced clinical and radiographic improvement in TB patients. In contrast, studies carried out by Ralph et al. and Daley et al. observed no significant improvement in the culture conversion rate in Vitamin D supplemented patients. It is debated whether culture conversion rate can be a parameter while studying the effect of Vitamin D supplementation. Relapse prevention or tissue damage restriction may prove to be appropriate parameters while studying Vitamin D supplementation effects. In addition, the immunomodulating role of Vitamin D has been recognized recently. Multicellular organisms have the capability to produce antimicrobial peptides (AMP) against microbial infection. Cathelicidin (LL-37) is one such AMP which is unique in terms of the presence of Vitamin D receptor (VDR) on its corresponding gene. It has been shown that Vitamin D enhances the production of LL-37. Toll-like receptor 2/1 senses M. tuberculosis and induces the expression of 1α-hydroxylase (CYP27B1) and VDR. This results in the conversion of 25-hydroxyvitamin D to 1,25-dihydroxyvitamin D (1,25D). 1,25D then binds to VDR and induces the production of cathelicidin and promotes autophagy  [Figure 1]a. The conundrum of Vitamin D-induced production of the AMP was also explained by Zasloff. UVB spectrum from sunlight induces the production of immunosuppressant alpha melanocyte-stimulating hormone and Vitamin D. In one of his writings, Zasloff very eloquently explained that Vitamin D acts as immunosuppressant to control the inflammatory response generated because of the UVB action on the skin including damage of DNA and epidermal lipid. On the one hand, it acts as immunosuppressant to control inflammation, while to counter it and protect the body from infection, it enhances the production of AMP to boost immunity. Antimicrobial properties of Vitamin D and Vitamin A have been observed in radiometric cultures where these vitamins and their metabolites showed direct inhibition of mycobacteria whereas Vitamin K and Vitamin E were found to be ineffective. Thus, Vitamin D not only possesses antimicrobial properties but also boosts immunity and thereby helps in eliminating the invading pathogen. It has been reported that Vitamin D concentration in humans depend on the season and latitude which indirectly correlates with TB manifestation. A study performed at Birmingham involving data from 9739 patients over a period of 28 years highlighted that TB notifications increased by 24.1% during summers. Low incidence of sunshine during winters decreased the Vitamin D concentration which led to higher TB incidence in the summer season that followed. A similar study was also conducted in South Africa and results followed the same pattern. Concentration of Vitamin D in humans depends on various factors that include biosynthesis by human body, pigmentation, latitude, dietary supplementation, obesity, genetics, and disease status. Deficiency of Vitamin D (<50 nmol/l 25(OH)D) is a global problem, and areas such as Middle East and South Asia have severe deficiency which in turn may increase the susceptibility to various diseases. The emergence of drug-resistant TB globally necessitates discovery of newer and more potent drugs and novel approaches to combat it. Resistance against newly approved antituberculous compounds has further complicated the scenario. It is time to focus on new drug discovery to tackle TB. In this context, the role of vitamins is being revisited. Vitamins have better acceptance to the treating physicians and patients because of its proven efficacy in the fortification of health and a general sense of well-being. Use of different vitamins as a diet supplement in the treatment of TB has been tried off and on in the past. However, recent knowledge that biosynthesis of some of the vitamins such as biotin and thiamin are vital to the growth and survival of M. tuberculosis has brought the focus back to vitamins. Two natural products amiclenomycin and actithiazic acid isolated from Streptomyces sp. 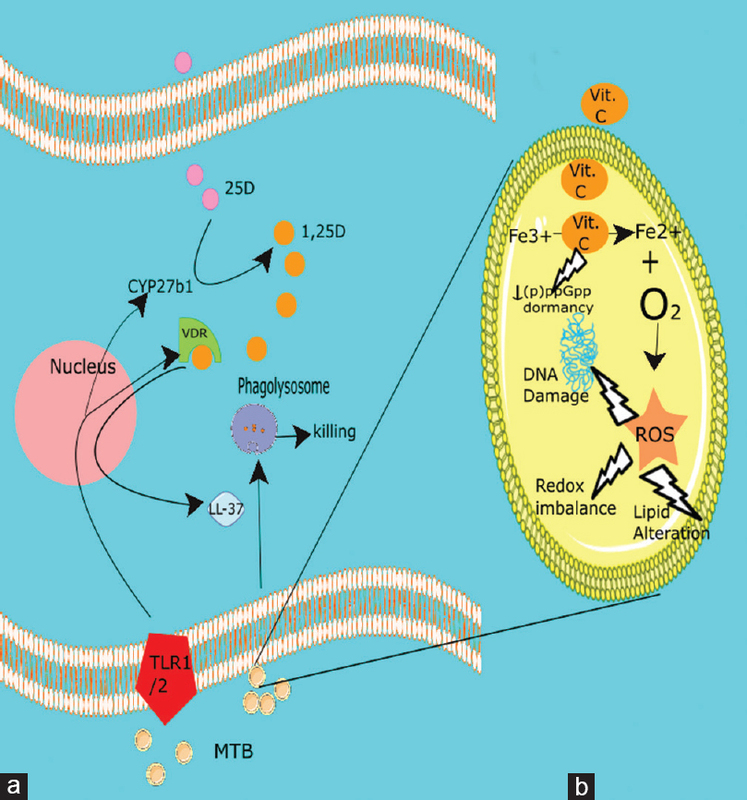 have shown promising results by targeting biotin biosynthetic pathway in M. tuberculosis. Similarly, it is clear that the thiamin biosynthetic pathway can be targeted by drugs. Studying mycobacterial genes from the perspective of new drug targets is therefore imperative, and pathways leading to the biosynthesis of biotin and thiamin form interesting study areas. Role of vitamins in the biology of M. tuberculosis is still undergoing a comprehensive research and requires more effort to completely understand the effects in the survival of this deadly pathogen. Thus, supplementation of antituberculous therapy with Vitamins D and C along with newer drugs to target the vital biotin or thiamin biosynthetic pathway seems to be a plausible novel approach to treat TB in the future. This study was financially supported by ICMR. World Health Organization. Global Tuberculosis Report 2016. Geneva: World Health Organization; 2016. Dobbs TE, Webb RM. Chemotherapy of tuberculosis. Microbiol Spectr 2017;5. doi:10.1128/microbiolspec. TNMI7-0040-2017. Ströhle A, Wolters M, Hahn A. Micronutrients at the interface between inflammation and infection – Ascorbic acid and calciferol. Part 2: Calciferol and the significance of nutrient supplements. Inflamm Allergy Drug Targets 2011;10:64-74. Ströhle A, Wolters M, Hahn A. Micronutrients at the interface between inflammation and infection – Ascorbic acid and calciferol: Part 1, general overview with a focus on ascorbic acid. Inflamm Allergy Drug Targets 2011;10:54-63. Greenstein RJ, Su L, Brown ST. Vitamins A & D inhibit the growth of mycobacteria in radiometric culture. PLoS One 2012;7:e29631. Vilchèze C, Hartman T, Weinrick B, Jacobs WR Jr. Mycobacterium tuberculosis is extraordinarily sensitive to killing by a Vitamin C-induced fenton reaction. Nat Commun 2013;4:1881. Madebo T, Lindtjørn B, Aukrust P, Berge RK. Circulating antioxidants and lipid peroxidation products in untreated tuberculosis patients in Ethiopia. Am J Clin Nutr 2003;78:117-22. Esposito S, Lelii M. Vitamin D and respiratory tract infections in childhood. BMC Infect Dis 2015;15:487. Combs GF Jr., McClung JP. The Vitamins: Fundamental Aspects in Nutrition and Health. Cambridge, Massachusetts, United States: Academic Press; 2016. Du Q, Wang H, Xie J. Thiamin (Vitamin B1) biosynthesis and regulation: A rich source of antimicrobial drug targets? Int J Biol Sci 2011;7:41-52. Salaemae W, Azhar A, Booker GW, Polyak SW. Biotin biosynthesis in Mycobacterium tuberculosis: Physiology, biochemistry and molecular intervention. Protein Cell 2011;2:691-5. Settembre E, Begley TP, Ealick SE. Structural biology of enzymes of the thiamin biosynthesis pathway. Curr Opin Struct Biol 2003;13:739-47. Begley TP, Downs DM, Ealick SE, McLafferty FW, Van Loon AP, Taylor S, et al. Thiamin biosynthesis in prokaryotes. Arch Microbiol 1999;171:293-300. Khare G, Kar R, Tyagi AK. Identification of inhibitors against Mycobacterium tuberculosis thiamin phosphate synthase, an important target for the development of anti-TB drugs. PLoS One 2011;6:e22441. Roje S. Vitamin B biosynthesis in plants. Phytochemistry 2007;68:1904-21. Mock DM, Malik MI. Distribution of biotin in human plasma: Most of the biotin is not bound to protein. Am J Clin Nutr 1992;56:427-32. Hebbeln P, Rodionov DA, Alfandega A, Eitinger T. Biotin uptake in prokaryotes by solute transporters with an optional ATP-binding cassette-containing module. Proc Natl Acad Sci U S A 2007;104:2909-14. Rodionov DA, Mironov AA, Gelfand MS. Conservation of the biotin regulon and the BirA regulatory signal in Eubacteria and Archaea. Genome Res 2002;12:1507-16. Lin S, Cronan JE. Closing in on complete pathways of biotin biosynthesis. Mol Biosyst 2011;7:1811-21. Keer J, Smeulders MJ, Gray KM, Williams HD. Mutants of Mycobacterium smegmatis impaired in stationary-phase survival. Microbiology 2000;146(Pt 9):2209-17. Sassetti CM, Boyd DH, Rubin EJ. Genes required for mycobacterial growth defined by high density mutagenesis. Mol Microbiol 2003;48:77-84. Rengarajan J, Bloom BR, Rubin EJ. Genome-wide requirements for Mycobacterium tuberculosis adaptation and survival in macrophages. Proc Natl Acad Sci U S A 2005;102:8327-32. Dai R, Wilson DJ, Geders TW, Aldrich CC, Finzel BC. Inhibition of Mycobacterium tuberculosis transaminase BioA by aryl hydrazines and hydrazides. Chembiochem 2014;15:575-86. Kitahara T, Hotta K, Yoshida M, Okami Y. Biological studies of amiclenomycin. J Antibiot (Tokyo) 1975;28:215-21. Sandmark J, Mann S, Marquet A, Schneider G. Structural basis for the inhibition of the biosynthesis of biotin by the antibiotic amiclenomycin. J Biol Chem 2002;277:43352-8. Shi C, Geders TW, Park SW, Wilson DJ, Boshoff HI, Abayomi O, et al. Mechanism-based inactivation by aromatization of the transaminase BioA involved in biotin biosynthesis in Mycobaterium tuberculosis. J Am Chem Soc 2011;133:18194-201. Park SW, Casalena DE, Wilson DJ, Dai R, Nag PP, Liu F, et al. Target-based identification of whole-cell active inhibitors of biotin biosynthesis in Mycobacterium tuberculosis. Chem Biol 2015;22:76-86. Ogata K, Izumi Y, Tani Y. The controlling action of actithiazic acid on the biosynthesis of biotin-vitamers by various microorganisms. Agric Biol Chem 1973;37:1079-85. Nishikimi M, Yagi K. Ascorbic acid: Biochemistry and biomedical cell biology. Subcell Biochem 1996;25:17-35. Field CJ, Johnson IR, Schley PD. Nutrients and their role in host resistance to infection. J Leukoc Biol 2002;71:16-32. Andosca JB, Foley JA. Calcium ribonate and Vitamin C (Nu 240-10) in the treatment of tuberculosis. Dis Chest 1948;14:107-14. Getz HR, Long ER, Henderson HJ. A study of the relation of nutrition to the development of tuberculosis. Influence of ascorbic acid and Vitamin A. Am Rev Tuberc Pulm Dis 1951;64:381-93. Taneja NK, Dhingra S, Mittal A, Naresh M, Tyagi JS. Mycobacterium tuberculosis transcriptional adaptation, growth arrest and dormancy phenotype development is triggered by Vitamin C. PLoS One 2010;5:e10860. Khameneh B, Fazly Bazzaz BS, Amani A, Rostami J, Vahdati-Mashhadian N. Combination of anti-tuberculosis drugs with Vitamin C or NAC against different Staphylococcus aureus and Mycobacterium tuberculosis strains. Microb Pathog 2016;93:83-7. Narwadiya SC, Sahare KN, Tumane PM, Dhumne UL, Meshram VG.In vitro anti-tuberculosis effect of Vitamin C contents of medicinal plants. Asian J Exp Biol Sci 2011;2:22. Mishra A, Sarkar D. Qualitative and quantitative proteomic analysis of Vitamin C induced changes in Mycobacterium smegmatis. Front Microbiol 2015;6:451. Syal K, Bhardwaj N, Chatterji D. Vitamin C targets (p) ppGpp synthesis leading to stalling of long-term survival and biofilm formation in Mycobacterium smegmatis. FEMS Microbiol Lett 2017;364. pii: Fnw282. Volchegorskii IA, Novoselov PN, Astakhova TV. The effectiveness of ascorbic acid and emoxipin in treatment of infiltrative pulmonary tuberculosis. Klin Med (Mosk) 2007;85:55-8. Selvaraj P, Harishankar M, Afsal K. Vitamin D: Immuno-modulation and tuberculosis treatment. Can J Physiol Pharmacol 2015;93:377-84. Facchini L, Venturini E, Galli L, de Martino M, Chiappini E. Vitamin D and tuberculosis: A review on a hot topic. J Chemother 2015;27:128-38. Stead WW, Senner JW, Reddick WT, Lofgren JP. Racial differences in susceptibility to infection by Mycobacterium tuberculosis. N Engl J Med 1990;322:422-7. Salahuddin N, Ali F, Hasan Z, Rao N, Aqeel M, Mahmood F, et al. Vitamin D accelerates clinical recovery from tuberculosis: Results of the SUCCINCT study [Supplementary cholecalciferol in recovery from tuberculosis]. A randomized, placebo-controlled, clinical trial of Vitamin D supplementation in patients with pulmonary tuberculosis'. BMC Infect Dis 2013;13:22. Ralph AP, Waramori G, Pontororing GJ, Kenangalem E, Wiguna A, Tjitra E, et al. L-arginine and Vitamin D adjunctive therapies in pulmonary tuberculosis: A randomised, double-blind, placebo-controlled trial. PLoS One 2013;8:e70032. Daley P, Jagannathan V, John KR, Sarojini J, Latha A, Vieth R, et al. Adjunctive Vitamin D for treatment of active tuberculosis in India: A randomised, double-blind, placebo-controlled trial. Lancet Infect Dis 2015;15:528-34. Cegielski P, Vernon A. Tuberculosis and Vitamin D: What's the rest of the story? Lancet Infect Dis 2015;15:489-90. Chun RF, Adams JS, Hewison M. Immunomodulation by Vitamin D: Implications for TB. Expert Rev Clin Pharmacol 2011;4:583-91. Zasloff M. Fighting infections with Vitamin D. Nat Med 2006;12:388-90. Koh GC, Hawthorne G, Turner AM, Kunst H, Dedicoat M. Tuberculosis incidence correlates with sunshine: An ecological 28-year time series study. PLoS One 2013;8:e57752. Martineau AR, Nhamoyebonde S, Oni T, Rangaka MX, Marais S, Bangani N, et al. Reciprocal seasonal variation in Vitamin D status and tuberculosis notifications in Cape Town, South Africa. Proc Natl Acad Sci U S A 2011;108:19013-7. Edwards MH, Cole ZA, Harvey NC, Cooper C. The global epidemiology of Vitamin D status. J Aging Res Clin Pract 2014;3:148-58.